Used to monitor filter clogging in clean air industry. Cost effective way to monitor filter clogging in clean air industry. In pharmaceutical, food and chemical processes, small batches of compounds are to be dried. Dryers specially made for this purpose use hot dry air. Air is sucked from the room through filters and blown over heater coils. The blower forces this hot air through the compound to be dried. Part of the compound gets carried along with the air while being removed by an exhaust blower. 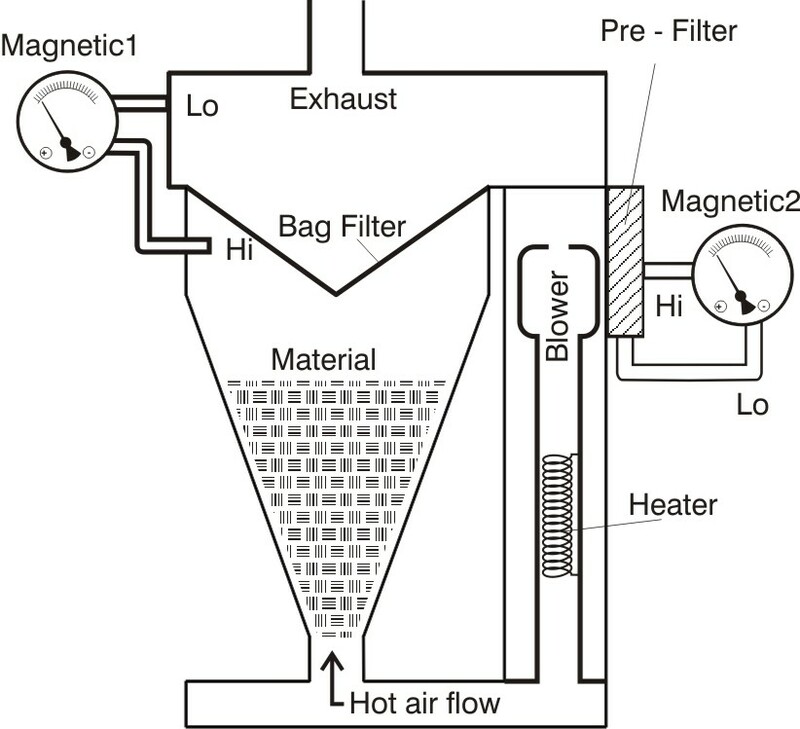 A collector or bag filter is used to collect it. MagneticTM instruments are used for pre-filter as well as collector filter to monitor clogging. MagneticTM instrument with switch can start cleaning cycle of collector filter at preset differential pressure. High quality filtered air is required in certain surroundings. The Gauge monitors the performance of the air filter. In pharmaceutical industry, hospitals, semiconductor industry sophisticated air handling and filtration units are used. These units use very high performance air filters at various locations. As the air quality and flow rate of air depends on the filter condition, these filters have to be monitored regularly. MagneticTM instrument with switch offers a very reliable and cost effective solution for this application. The instrument is also ideal for measuring pressure drop across filters used on laminar air flow benches, dispensing booths, fluid bed dryers etc. Ballast water is an integral part in the smooth functioning of a ship. 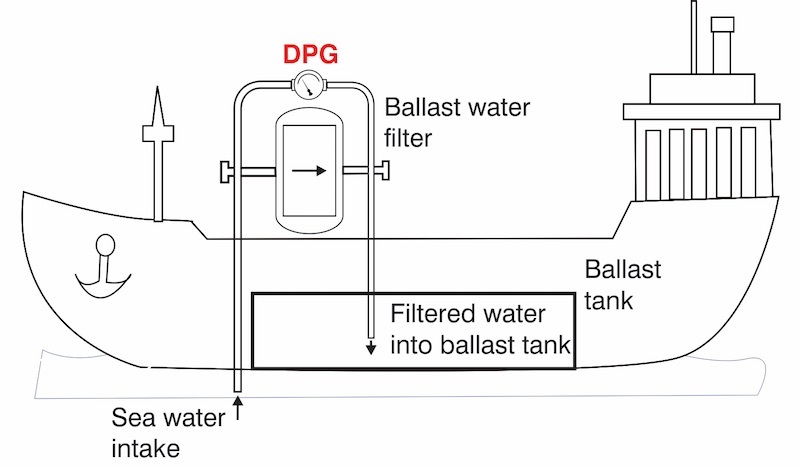 Ballast tanks are filled and discharged depending upon whether the ship is being loaded or unloaded. When a ship discharges its ballast tanks in another part of the world there is a high risk of introduction of alien marine organisms in the local waters. It is required that water be filtered to remove marine organisms and sediments before it is fed to ballast tanks. A differential pressure gauge is mounted across a marine filter and it is used to start the auto cleaning cycle once a certain preset differential pressure is reached. Used to moniter filter clogging in the irrigation industry. Cost effective method to moniter clogged filter. Water from canals is filtered before it is used for irrigation. The Hirlekar Precision DGC 320 detects when the filter is clogged and gives out a signal using a switch. At this point, back flush starts which helps remove and drain the sediments from the filter thereby ensuring that unfiltered water does not get get supplied to farms. Gauge with switch is set to signal an alarm at a preset value of pressure difference. 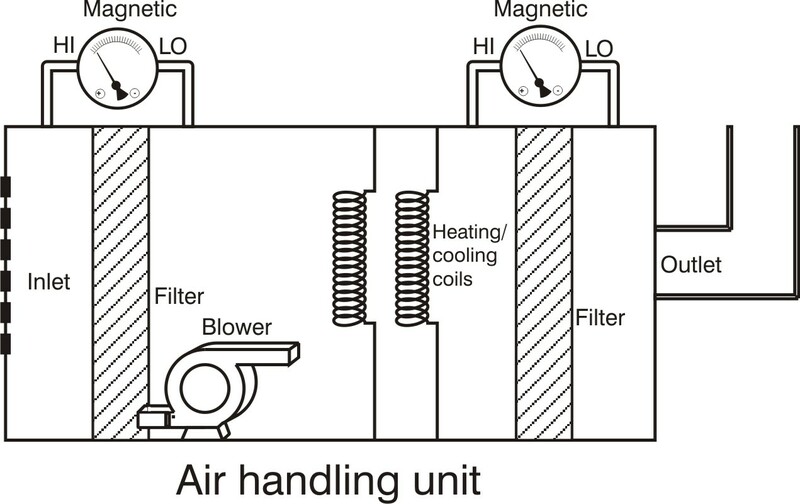 Diaphragm type differential pressure instruments are used across heat exchangers to measure pressure difference in transformer oil cooling system. Here heat exchanger uses a higher pressure on one side to ensure direction of leakage and avoid mixing of water with oil. This is essential for safety of transformer. In transformer oil cooling system, where oil is at a higher temperature is passed through heat exchanger with water as cooling medium. Instruments with switch in such application, provides a signal for alarm at a preset value of pressure difference. Other than above, differential pressure gauge is also used to measure differential pressure across the heat exchanger where pressure drop increases due to scaling. Cost effective instrument in applications with higher amount of dirt particles in natural gas industry. For higher amount of dirt particles diaphragm instruments are recommended. Mono-block construction: Model GX-100 has a mono-block construction with rolling diaphragm inside. Choice of mounting holes: A choice of 54mm or 55mm mounting holes is available to install them on manifold valves. Red follower pointer: A red follower pointer is a popular option. Cost effective way to monitor filter clogging. Compact. Sturdy and reliable instrument. Piston or diaphragm type differential pressure instrument with switch, compatible with fluid and measuring range are ideal for monitoring filter condition. The field adjustable switch initiates cleaning cycle in self-cleaning and back wash filters automatically at a preset differential pressure. Used to monitor pressure drops across strainers in petroleum/ chemical industry. Cost effective way to monitor pressure drop in petroleum / chemical industry. Differential pressure instruments are used to monitor pressure drop across strainer used in line with positive displacement flow meters. Petroleum oil companies and chemical plants etc. 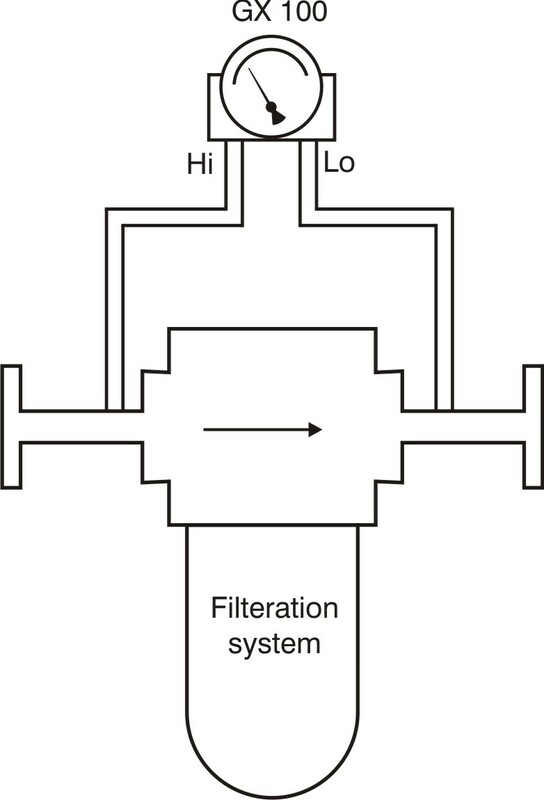 use positive displacement flow meters to measure volume. Contaminated fluids can damage these expensive and critical flow meters. These meters need filtered fluids for proper functioning, so strainers are used. Positive displacement flow meter manufacturers specify maximum pressure drop across the meter including strainer to the buyer for designing the pumping system. If pressure drop across the strainer increases than specified, the pumping energy cost increases. Piston type differential pressure instruments therefore become ideal for this application. Used to test system differential pressure and to check assemblies used in back flow prevention. Cost effective method of measuring backflow. Diaphragm type instrument Model 300 DGC with bottom and vent connection is used for testing system differential pressure and checking assemblies used for back flow prevention. 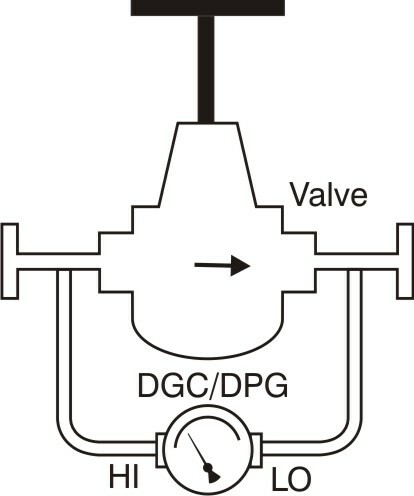 Flow rate can be controlled using valves with the assistance of the gauge. Cost effective method of monitoring flow. Flow rate adjustment is done with the help of valves in pipelines. Diaphragm type differential pressure instruments selected as per service and range are used to control the flow rates. These gauges are also available with glycerin filing for pulsating flow conditions. 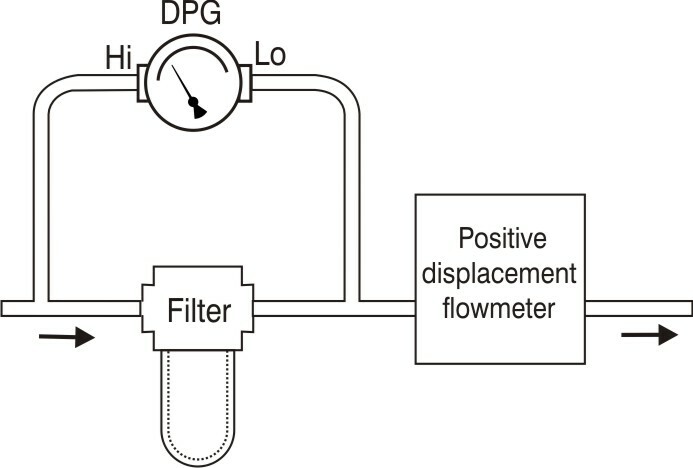 Reverse flow rate can be detected with the use of a differential pressure instrument. 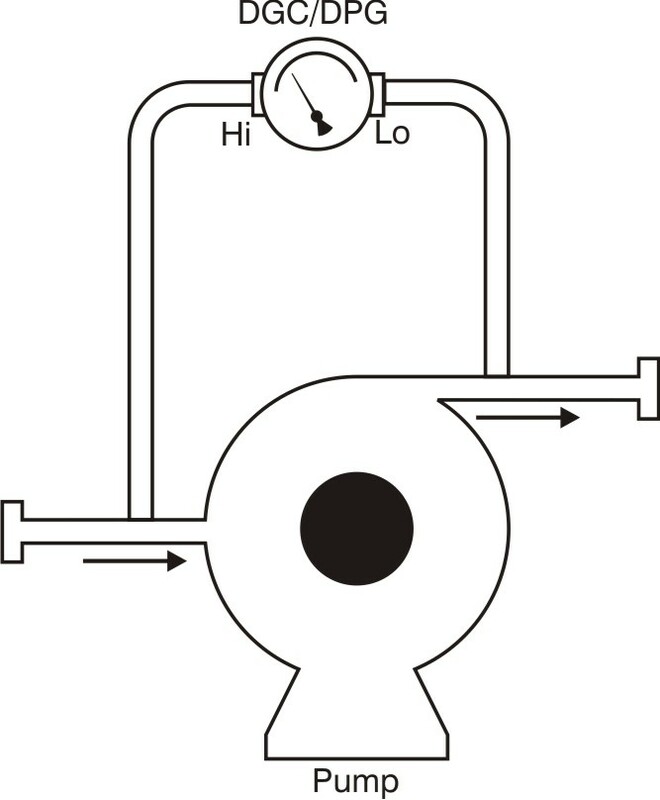 Reverse flow condition can be detected with the use of a differential pressure instrument. When differential pressure is measured across a restriction in the flow line , we can measure flow rate. In applications were change in direction of flow is to be detected. A center zero instrument can indicate flow direction as well as measure flow. If the fluid in the line is not flowing, the pointer will remain at zero position and will deflect in either direction depending on the direction of the flow. It also can be used with a switch. 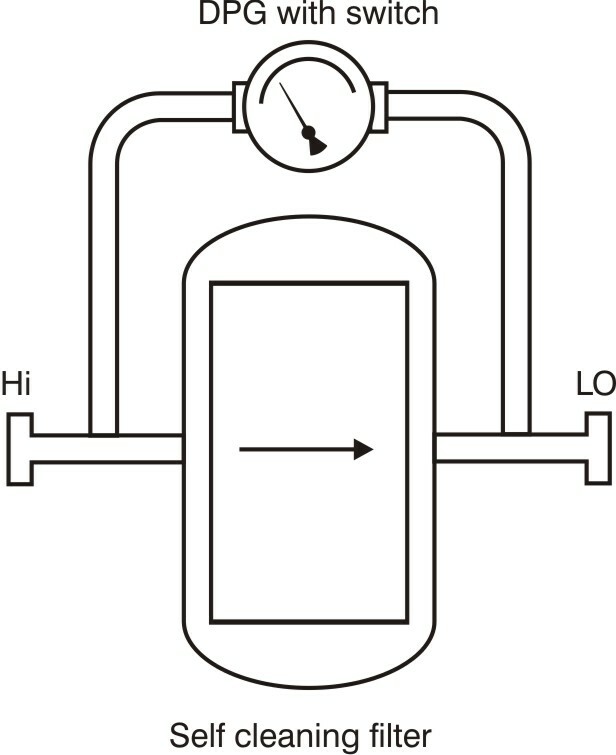 Visual indication of liquid level in cryogenic tanks. Diaphragm type differential pressure instrument calibrated in weight or volume is effectively used in cryogenic tank level monitoring. Tanks can be stationery - vertical or horizontal. These instruments are used in tanker transport vehicles too. Typically, these instruments have dry gauge design with no liquid filling in case. Drastic temperature changes & condensation: For environments with drastic temperature changes, condensation might occur on glass. In this case, LX series cases are recommended which can be opened and cleaned. Cleaned for oxygen service: All instruments are cleaned for oxygen service. 3 scales: Dials can be produced to show LIN LOX LOR in 3 scales. CO2 tanks can also use these gauges. Remote Applications: 700 DGC is also available with a switch option for monitoring of gauges in remote application. Visual indication of liquid level. 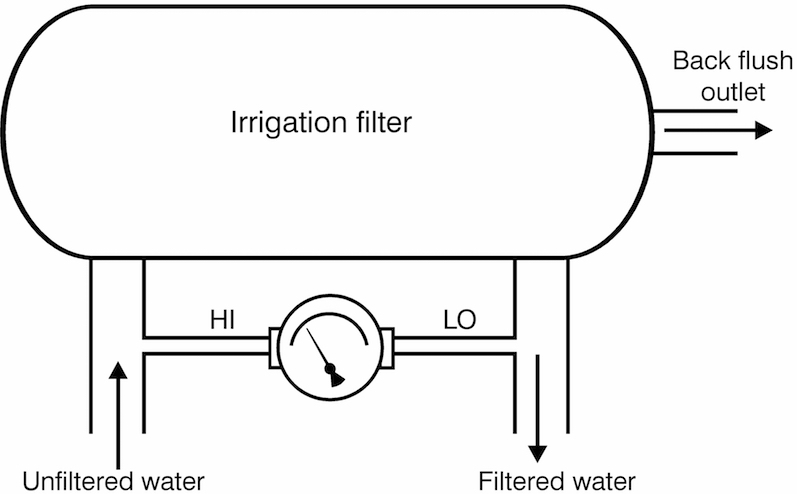 Diaphragm instruments can be used as liquid level indicators. 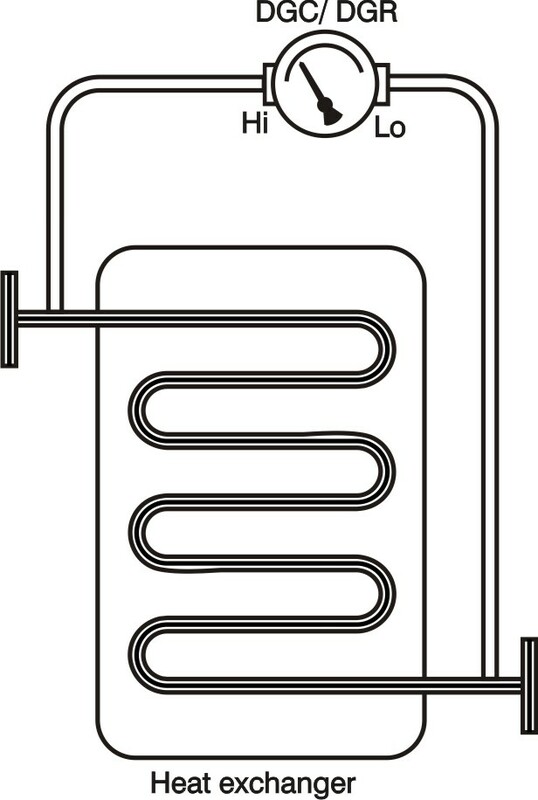 With high pressure port connected to a tapping at the bottom of tank and low port kept open to atmosphere as shown. Differential pressure instrument calibrated in units like mm, inches of water etc. can be used to measure liquid level as a function of head (differential pressure) which is specified by the user. 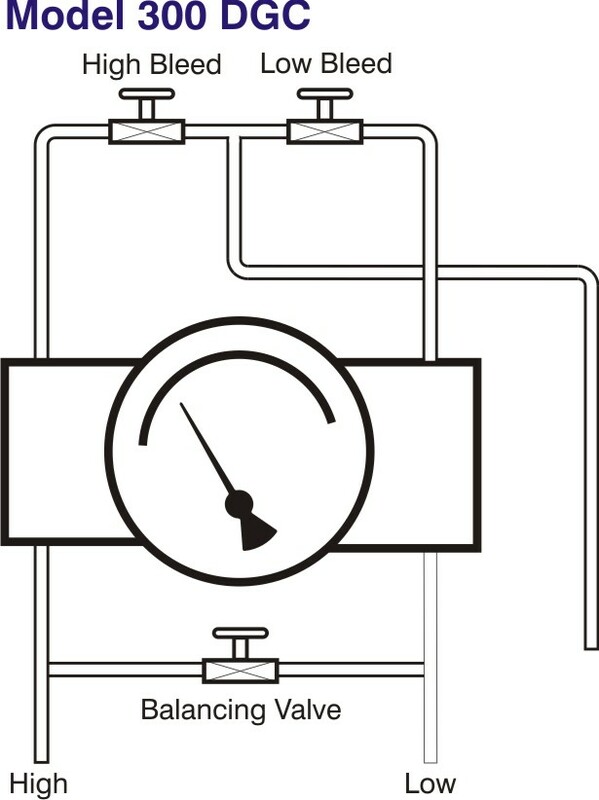 If the tanks are closed or pressurized, the low pressure port can be connected to the top of the tank as shown in the figure. 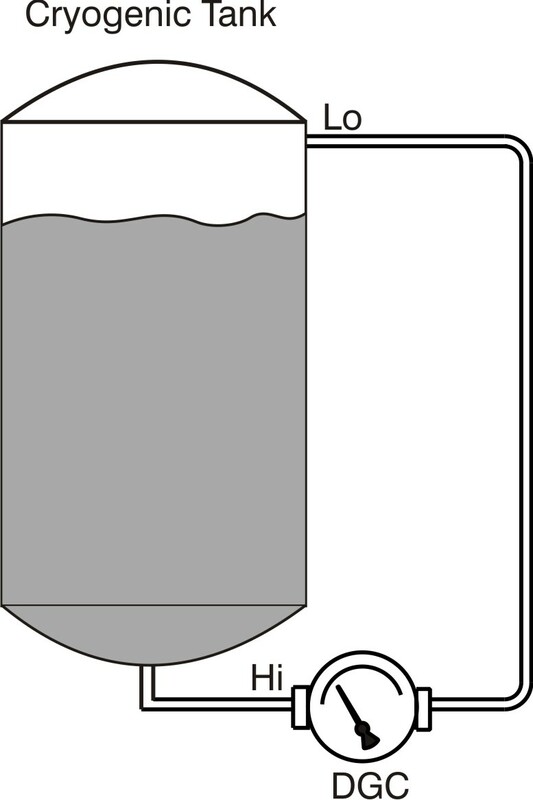 Regardless of the tank pressure, liquid inside will give similar head as in an open tank and the instrument will indicate level. 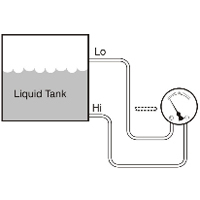 To measure the correct level in open tanks, the instrument should be mounted at the bottom level of the tank. Malfunction / blockage of pump will lead to increase or decrease in differential pressure. The gauge can be used to warn the operator for high or low setting. Cost effective way to warn operator about pump condition. Diaphragm type differential pressure instrument can be used to monitor pump performance. Addition of switch is very useful to monitor pumps installed at remote locations. The malfunctioning of a pump or blockage in a pipeline will lead to increase or decrease in differential pressure. This change in differential pressure can be used to warn the operator for high or low settings.